The company’s properties are all located in Mongolia with its primary focus being the Chandman-Yol copper-gold project located in the highly prospective Altai mountain range near Khovd in western Mongolia and the Khavchuu gold project, located in northern Mongolia and only 14 km from the Centerra Gold Boroo mill complex. Both projects are advancing quickly, the company recently announced results from a 2011 drill program at Chandman, the commencement of drilling at Khavchuu, and further drilling planned at Chandman for 2012. Chandman-Yol, the company’s 1400 km2, previously undrilled, flagship property spans nine 100%-owned licences, five of which are subject to a 2.5% net smelter royalty (NSR) payable to a third party. The company spent $6M over the past four years. Work included geophysics, geochemistry and IP surveys which resulted in the identification of 7 target areas (see map below). To date, drilling has been focussed at the KY copper-gold porphyry. 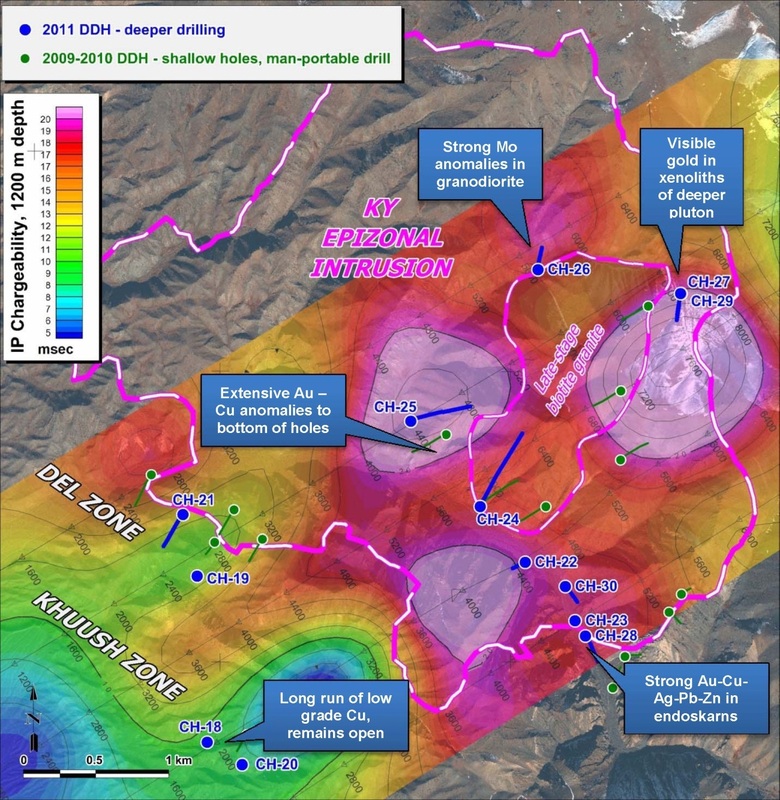 On March 2, 2012, Altan Rio announced results from a 13-hole, 7800 m drill program at the Chandman-Yol project targeting copper-gold anomalies from IP features and laid out the company’s drill targets for 2012. In the announcement, dated March 2nd, 2012, the company stated that it had found “strong molybdenum anomalies (100 ppm) in the northwestern sector, high grade gold (28 g/t) in the northeastern sector, and unusually high silver (100+ g/t), lead (>10,000 ppm) and zinc (>10,000 ppm) grades in the southeastern sector.” Elevated copper occurs throughout the large 2 km diameter porphyry intrusive system with sporadic drill intersections over 1% copper. The company was disappointed that their drill contractor was not able to get many of the holes to depth to test the targeted IP features (see above) although mineralization identified above these features has significantly upgraded the targets. 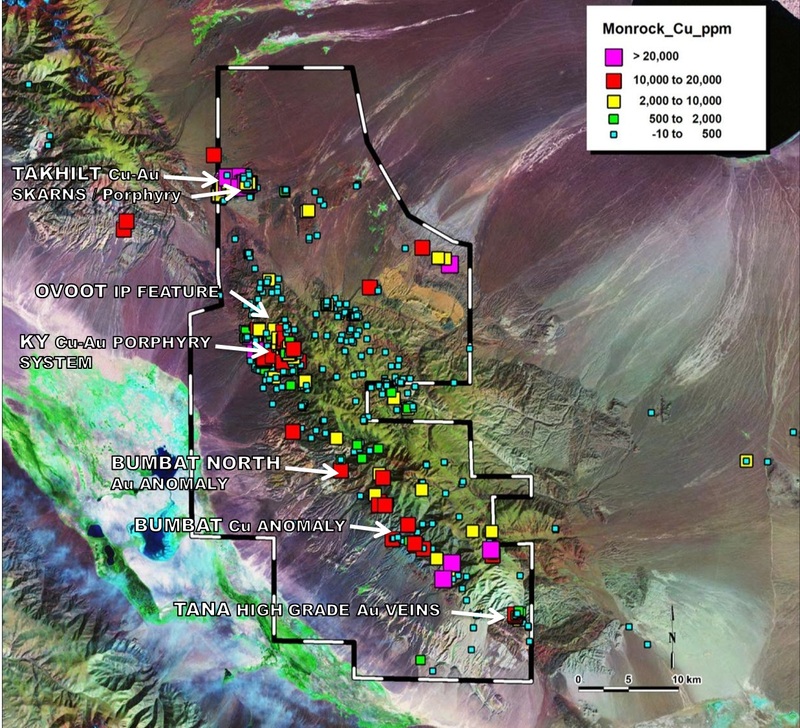 The highlighted intercepts consisted mainly of silver with the more disseminated copper found in the same holes being indicative of the porphyries found in this region of Mongolia. This round of drilling for the copper-gold porphyry on the Chandman-Yol project, however, is just the start of Altan Rio’s efforts in 2012. The company has combined its past geological mapping, extensive geochemical surveying, and other elements of geological reconnaissance on the Mongolian project to identify at least four new zones and intrusions. 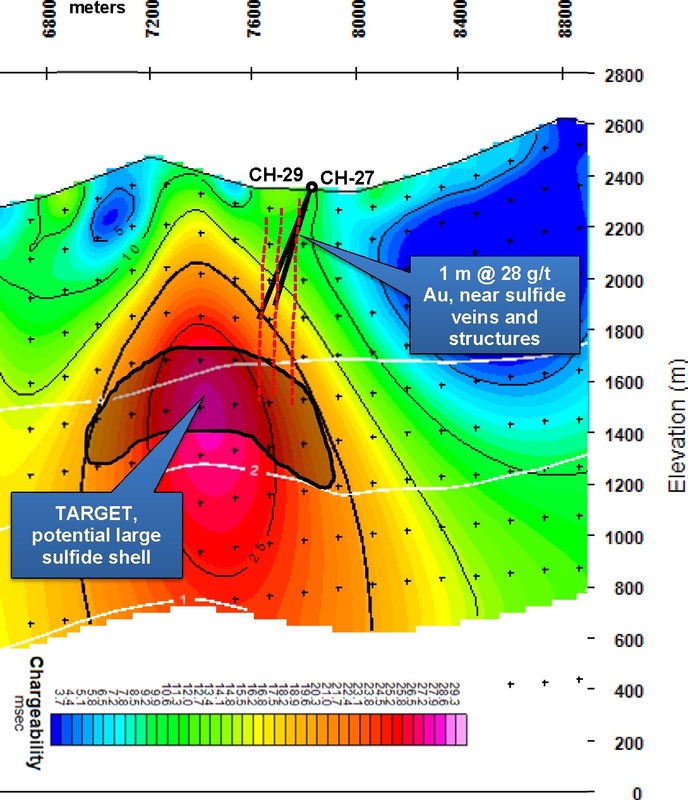 Those additional zones, which are dispersed over a strike length of over 50 km, have also been targeted and Altan Rio is planning on drilling deeper in its next drilling campaign at Chandman in order to test the strong IP features deeper within the porphyry (see cross section below). In other news, on March 5th, Altan Rio announced the commencement of a six hole, 1800 m drill program at the Khavchuu gold project. Altan Rio has the option to acquire 100% ownership of the 17,000 acre Khavchuu project which has multiple gold targets across the property. The project is located near infrastructure, only 8 km away from Centerra Gold’s (TSX: CG) Boroo mine and mill complex. The project has never been drilled, and Altan Rio is keen to see the first holes into this project with Boroo mine style geology. Kelly Cluer, the company’s Director of Exploration is very experienced in the region, having worked previously as Exploration Manager for Centerra. He believes that Altan Rio’s geochemical surveys and the geological setting show it as prospective for a “Boroo-style orogenic lode gold system.” This type of project has significant quartz-sericite-sulfide alteration zones and also strong and distinct Induced Polarization (IP) anomalies. Altan Rio has taken more than 1200 samples on the project and used them to focus in on the better results of the IP survey to identify and prioritise drill targets. Although the company is a relatively new listing, having become quoted on the TSX Venture in January 2012, it is worth noting that Altan Rio was founded in 2007 and was well financed to actively explore through the financial crisis. The company is now in a rather unique position of being able to move quickly to drilling on several targets across two projects. The company was founded by John Jones, prominent player in the Australian mining sector, Evan Jones and Kelly Cluer. The company is approximately 40% owned by its founders with Mongolian domiciles significantly holding more than 15% of Altan Rio’s issued capital. Altan Rio has a total market capitalization of approximately $22 million.